The French have always built 'interesting' aircraft. At least that is the point of view of many to whom the 'norm' of 30's and 40's aircraft have been Spitfires, Messerschmitts and Mustangs. In fact, some have been more 'interesting' than others and a few have been downright weird. I only have to point to the Potez 540 series as a case in point. Well, you can add to that list the Loire 46. 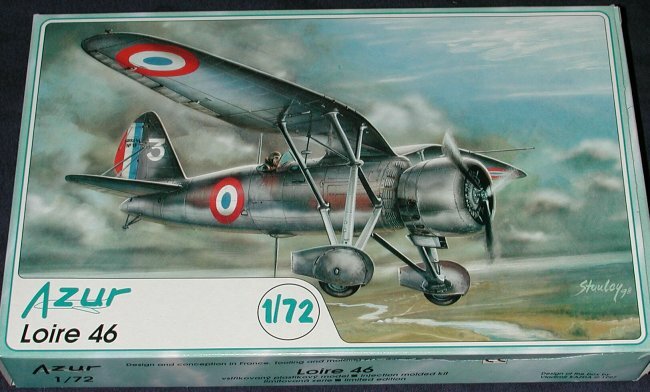 Though not an unlovely aircraft as it does have a certain grace that was lacking in most of its Gallic contemporaries, it was, nevertheless, basically an unwanted aircraft. First flying in 1934 and based on earlier parasol fighters from Loire, this one was rather heavily armed for the time with 2 20mm cannon. Naturally this was changed to the usual 7.7mm machine guns, undoubtedly because of their lighter weight. A total of 70 of these aircraft were built and they saw brief service from about mid-1935 to 1938 when the units flying the planes replaced them with the slightly more effective Morine-Saulnier 406. Those surviving Loire 46s were then sent to training commands where they were used as advanced fighter trainers. A small number were sold to the Spanish Republicans for use against the German backed Nationalist forces. Basically an MPM kit, it has all of the traits of the products of that company. Fortunately for us, as the line develops the overall quality of the molding and engineering improves so this little fighter looks pretty good out of the box. A real blessing (at least from my point of view) is that there is little in the way of resin or etched metal in with this kit. The resin is basically the engine and is very nicely molded. Undoubtedly it is a generic engine but more than adequate. I have no idea what a Gnome-Rhone 14 Kfs engine is supposed to look like so I'll go the 'ignorance is bliss' route on this one. The etched metal in the kit is basically instrument panel, seat belt and some rudder pedals. A small vac formed canopy is included. Now the most difficult portion of building this will probably be the landing gear/wing struts. It is a rather complicated looking construct, but the instructions are very good in showing how the parts fit. I'd recommend a razor saw to remove the strut material as often these short run kits have rather brittle plastic that is easily snapped when removing it using cutters. Basically your lone option is whether to use the spats or not. If doing the French version, use them. If doing the Spanish one, leave them off. The instructions are basically a large exploded view with some smaller areas showing detail construction. 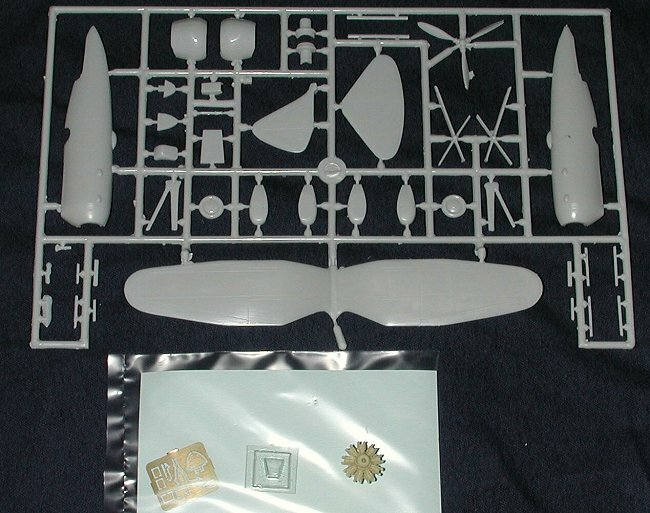 You'll have to do some drilling for the wheels and perhaps some sprue stretching, but nothing that isn't called for on most of these types of kits. Markings are given for two aircraft; one 6 Escadrille plane from 1938 in the usual multi-hued camo that is so interesting for French planes. The Spanish one is overall aluminum with large red bands on wings and fuselage (to keep them from being shot down by friendly A-A fire, undoubtedly). Decals are by Propagteam so will be very thin and are superbly printed. Unusually, it seems as if the blue is the proper color and not too light as it has been on so many Azur decal sheets. You get rudder stripes as decals but also the serial alone in case you wish to paint them on instead. One thing about Azur is that they always manage to come up with subjects that are interesting and unusual. This one definitely fits into both categories and should be a really neat looking model when completed.